I have done some unforgettable kayaking and canoeing trips in my time, skimming across blue green prisms of water, trailing stunning coastlines and river banks, spying on nature in its quiet solitude. I remember one December sea-kayaking alongside Freycinet National Park in Tasmania; one moment we battled fierce headwinds as we tried to round a rocky headland; the next, a millpond in front of us where large stingrays appeared suspended below. 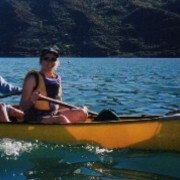 One Easter, holidaying on Steward Island (New Zealand), we kayaked up Patterson Inlet. There, I encountered my first ever elephant seal. It was in a shallow bay, sighing and huffing so heavily I thought it must be a she, and in labour. Another time, we rafted down the fast-flowing snow-swollen Sunkosi River in Nepal. And, during one magical northern summer, in a Canadian canoe, we paddled the Bowron Lakes in British Columbia, a natural, 116 km quadrangle of rivers and lakes at 2,000 metres altitude on the edge of the Rocky Mountains. It’s deservedly one of the top 10 classic canoe circuits in the world. We drifted beside long-legged moose munching on sweet bulrushes; we saw the telltale signs of beaver homes. That trip made its way in to Books 2 and 3 of The Iceberg Trilogy. But quite possibly, this all pales in comparison to the recent experience Jennifer Byrne had sea kayaking along the South-east coast of Greenland, near the 80th parallel. She writes about in her article, Out in the Cold, in the March issue of Qantas’ in-flight magazine. Reading her account, I felt awe and envy. How do you capture the expanse and grace and otherworldliness of such a place? I think she comes close. These kayak trips become the stuff of dreams. It is the silence, most of all. The blissful hush as we paddle through the still water, broken only by the splash of seals breaking the surface. The flapping wings of birds. 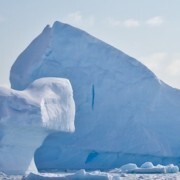 The groan of glaciers and the warning crack of an iceberg about to overturn. We see everything more closely, away from the crowd and constant hum of the ship’s motors. … We paddle, then drift, then paddle again, turning circles around icebergs. … We learn how it feels to be in a world other than the one we know. 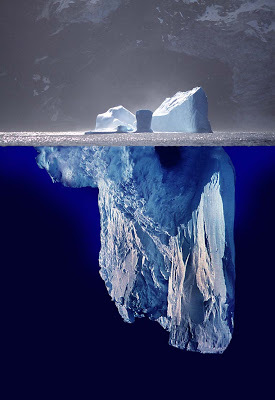 My sharpest memory is of the silence shattered by gunfire, shot after echoing shot, in reality the sound of ice as the mighty Greenland ice sheet shifts, flows, settles – a living thing, 3 km deep at its centre – the sound of the Earth going about its business. What about yourself? Have you had some amazing adventures out on the water? And what do you think about the pic above? It really is amazing how deep that ice sheet is.